Lena Grey is found guilty of murdering her husband, who was smothered in their bed. She offers no defense, and serves fourteen long years in prison. But within months of her release, his body is found in a disused morgue. Who was the man she killed before, and why did she lie about his identity? 'The difficult second novel', the 'sophomore slump' - as tough as it can be to break through in publishing (or screenwriting, acting, the sports world, etc), turning a promising start into sustained success can be even more difficult. Derbyshire writer Sarah Ward deftly avoids such concerns in A DEADLY THAW, which continues the high standards of her impressive 2015 debut IN BITTER CHILL. One of the things I most enjoy about Ward's writing is the way she weaves history and present together, threading in some important social issues (particularly issues facing women), without it being jarring. She has a subtlety and elegance to her storytelling which in a way almost obscures the thematic layers going on beneath the main crime plotline, so they cleverly sneak up on you rather than being shouted from a bully pulpit. Ward blends traditional British mystery writing with Nordic sensibilities, creating something that feels both fresh and timeless. 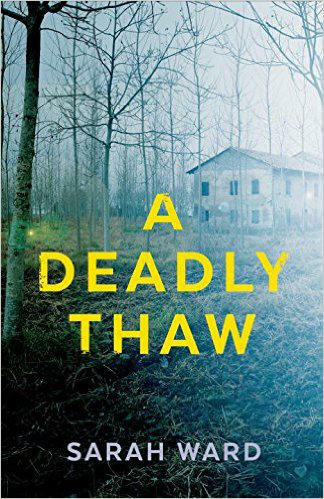 The early hook in A DEADLY THAW is a good one: a local woman, Lena Fisher, confessed to murdering her husband in their bed, served a long prison sentence, has been released, but now Lena's husband turns up recently murdered. Ward immediately has the reader's mind stirring: who was the man killed all those years ago? Why'd Lena identify the body as her husband's, and confess to killing her husband? Where has her not-then-murdered but now-murdered husband been for the decade-plus in between? And who killed him now, and why? Did Lena settle old scores? What is going on? 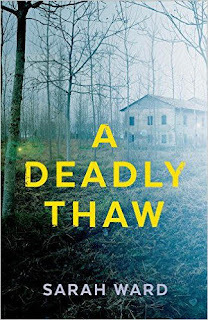 Similarly to her debut, Ward delivers a tale told from the perspective of both an interesting group of Derbyshire police, and a civilian character caught up in the investigation. So we welcome back DI Frank Sadler and DC Connie Childs, along with their colleagues, and this time around the non-cop protagonist is counselor Kat Fisher's, Lena's sister. For a long time, Kat has had to live with the fact that she's the sister of a convicted murderer. Now, just as the sisters are trying to move on their lives and heal from the past, it all comes crashing into the present. When Lena vanishes after her husband's body is discovered, things become even worse. Then a teenage boy starts delivering bizarre packages to Kat, including an ancient gun from the First World War. Kat and the cops are both left scratching their heads and scrambling for answers. Ward adroitly builds intrigue in A DEADLY THAW, switching between the past and present, and Kat's perspective and that of the cops. She has a particularly good touch for authentic characters; flawed and very human, full of foibles and inconsistencies. The interplay between the detectives feels very believable, and Ward does well to ensure none of them comes across as too heroic or favoured by the author. They each stumble, they're each full of good intentions and poor choices, and none come across as moving pieces existing solely as foils or to underline a pet authorial point. Sarah Ward is a fresh talent who tells a good story, and has something to say. Recommended. 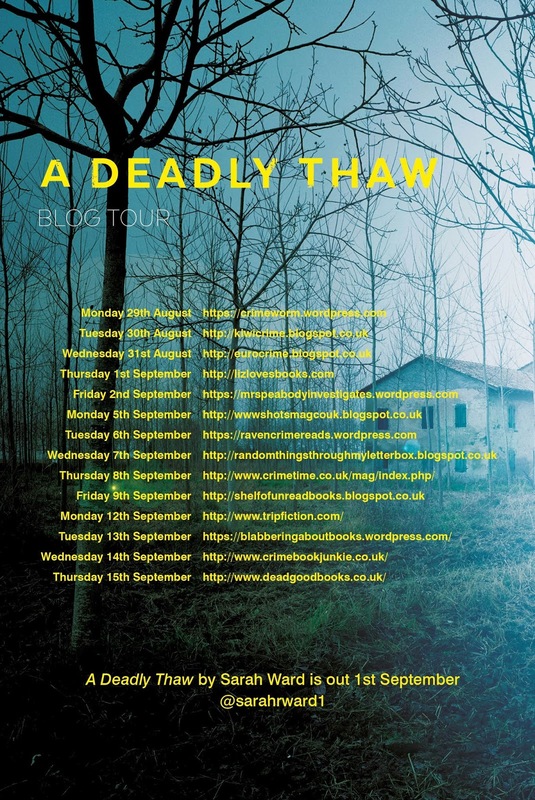 This review is part of the blog tour celebrating the release of Sarah Ward's second crime novel set in her home county of Derbyshire. Over the next fortnight you'll be able to read a variety of crime blogger's takes on Sarah's sophomore effort, as well as interviews or other pieces. Click on the image to the left to see the blogs that will be hosting Sarah and her book over the coming days. You can read my 9mm interview with Sarah Ward here.